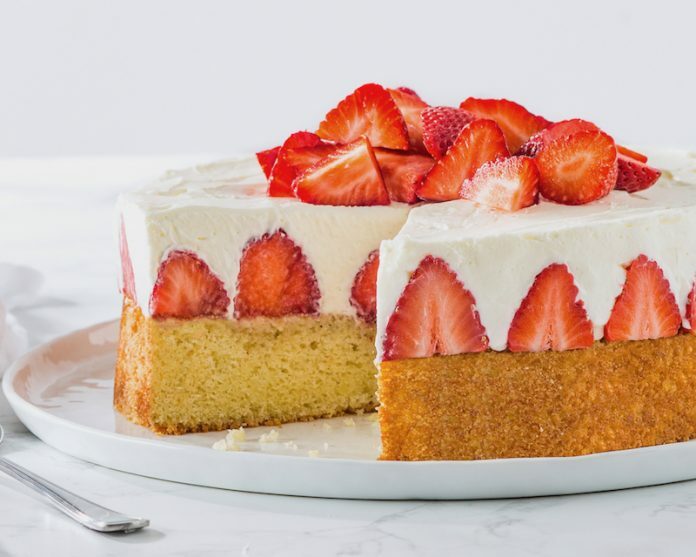 Président® butter lends a rich, tender crumb to this elegant Strawberries and Cream Cake. 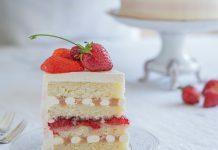 The epitome of French elegance and simplicity, this buttery almond cake is topped with fresh strawberries and a generous layer of Whipped Cream Filling. Preheat oven to 325°F (170°C). Spray a 9-inch springform pan with baking spray with flour. In the bowl of a stand mixer fitted with the paddle attachment, beat butter and sugar at medium speed until fluffy, 3 to 4 minutes, stopping to scrape sides of bowl. Add eggs, one at a time, beating well after each addition. Beat in almond extract. In a medium bowl, whisk together flour, ground almonds, baking powder, and salt. 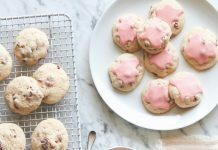 With mixer on low speed, gradually add flour mixture to butter mixture alternately with milk, beginning and ending with flour mixture, beating just until combined after each addition. Spoon batter into prepared pan, smoothing top with an offset spatula. Bake for 30 minutes. Cover with foil, and bake until a wooden pick inserted in center comes out clean, about 15 minutes more. Let cool completely in pan, about 1½ hours. 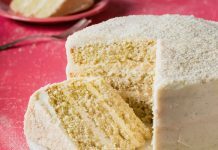 Loosen edges of cake with a thin knife. Carefully remove sides of pan. Wrap a 4-inch-wide strip of parchment paper around cake to form a collar. (You can use more than one strip of parchment, if necessary.) Replace sides of pan. Cut about half of strawberries in half lengthwise. Place strawberries, cut side down, on paper towels to dry completely. Pat remaining strawberries dry with paper towels. Arrange halved strawberries, cut side out, around sides of pan. Stand remaining strawberries about 1 inch apart in center of cake, trimming bottoms as necessary to level. Spread Whipped Cream Filling over strawberries to cover completely, smoothing top with a small offset spatula. Refrigerate overnight. Carefully remove sides of pan and parchment. Replace any loose strawberries, and patch any holes in Whipped Cream Filling. Garnish with quartered strawberries, if desired. Serve immediately. In the bowl of a stand mixer fitted with the whisk attachment, beat cream cheese and sugar at medium speed until softened and well combined. With mixer on medium-low speed, gradually add one-third of cream, stopping to scrape sides of bowl. With the mixer on medium speed, gradually add remaining cream, beating until stiff peaks form. (Do not overbeat.) Use immediately.